PUBLISHER: Simulation Publications Incorporated (SPI); rights to the entire WIE system currently held by Decision Games. RULEBOOK VERBAGE: WAR IN THE EAST is a simulation on a corps/division level of the Russo-German war of 1941-45. Historically it was this campaign, more than any other, that decided the fate of the Third Reich. The game covers the entire war from the Axis invasion of Russia to the final destruction of the Axis armies four years later. There are special rules to reflect the varying weather conditions that were so crucial in the campaign and those special conditions that existed in the far north. The Axis Player has a fixed reinforcement rate, but the Russian Player must decide what type of units he wants to produce by allocating his resources. These production decisions are critical in the game, as they were in the war. In addition to the Campaign Game, which simulates the entire war, there are four scenarios which simulate the situation at key times during the campaign. As the Campaign Game is necessarily very long and complicated, is is suggested player first play one of the Scenario in order to familiarize themselves with the game system and mechanics, and to avoid the complexities of the Russian production system. YEAR PUBLISHED (EDITIONS): April, 1974; this was published in a single flat tray. The second edition (September, 1976) appeared as a separate game and also as incorporated in War in Europe. Published errata as of September 1974 include with game. taken from on Web Grognards. The 2nd edition edition was issued in both double flat tray and detergent size box. The significant differences in 1st vs 2nd editions include: 4 mapsheets instead of 3 indicating a change of scale, Germans Replacement Divisions, Russian production and all replacements are done on a turn basis as cycle concept was implemented in 2nd edition, Partisans are an optional rule, Axis must maintain a continuous line of Axis units; the 2nd edition renumbered the WITE rules to fit in the WIE system, and the valuable designers notes with relevant insight was deleted in the 2nd edition. Game Testing and Development: Stephen Bettum, Oktay Oztunali, Thomas Walczyk, Edward Curran, Ken Hoffman, et. al. WGA COMPLEXITY SCALE (1-10): 6, fairly simple but very big. TYPICAL PLAYING TIME (HOURS): about 3-45 minutes per turn per scenario at decent player speed. Lots of multiple sessions for campaign game of 208 player turns for each side. MAP SCALE: 33 km (20 miles) per hex. TIME SCALE PER TURN: 1 week with cycle every 4 turns; 13 lunar cycles in a year. NUMBER OF GAME TURNS: Barbarossa 1941 (20 turns), Stalingrad 1942 (30 turns), Kursk 1943 (18 turns); Destruction of Army Group Center (20 turns) and maximum 208 turns for the full campaign. GAME INVENTORY (1st edition): 2000 counters (five full size counter sheets), four unmounted 22" x 32" game mapsheets, 22 page rules booklet including designer's notes and historical background, two Russian production charts, one production cost chart, one combat results chart, two air power charts, two game boxes, one die. Wargame Academy is steadily making a java application for WIE on an incremental basis. CWIE is an effective PBEM tool for the DOS platform. I have emulated this well on a DOS emulator for Macintosh. PBEM OPPORTUNITES: Contact Wargame Academy if interested in its JAVA strategy. On a low priority basis a java based WITE application is planned starting with a WITE tournament scenario where players secretly pick options. There is an active group of players using Computer War in Europe as a vehicle (to join, send the message 'subscribe' to 'warineur-request@halisp.net'). Beware however as some never played the boardgame version and hence are ignorant on the rational of the various restrictions not enforced in CWIE. Similarly, in many of the computer games lacking boardgamer sense of ethics, the concept of cheating may not be considered unethical. Before embarking in a year+ time commitment with 208 turns for each player, make sure your opponent(s) share a mind sets. I have found it best to 'interview' potential opponents for integrity, boardgame background and find a shared viewpoint of when to stop. 'Professional German' players will want to stop once a decisive victory has been thwarted, lacking interest in a drawn out defense. Other will play to the bitter end either way to establish a benchmark, point of reference. I once played six games in a year as the Russians never getting to play the offensive in 1943 (if i hadn't yet lost, the Germans wanted to start again)! WARGAME ACADEMY COMMENTS: War in the East was the first Monster wargame I owned and played. In one sense I prefer it to War in Europe due to its more manageable size. Although the Russian production is present, the lack of German production flexibility is missed. Against a competent Russian player, the Germans are unlikely to win. Both sides can lose due to poor or inexperienced commanders. This is an excellent team format play. One article by the designer (Dunnigan) details how it is suited for 3 person play as well (the front is divided into three sectors; all three play on one side than all three switch to the other side but playing a different sector.) WITE remains a great historical study tool. The scenarios are intriguing especially with double blind setup. (The computer setups in Computer WIE scenarios are horrible!). I acquired a copy of the WITE1st edition rulebook much later. Both the WITE 1st and 2nd edition rulebooks contain valuable designer note and justifications that are lacking in later editions. the forte of WITE (and the WIE system) is its simplicity despite the scope. Divisions are cookie cutter, naval and air are abstracted, there is no opposing play interaction during your turn. This makes War in Europe an excellent PBEM title via computer program such as CWIE. These strengths are also its weaknesses as view by gamers expecting greater realism and complexity. 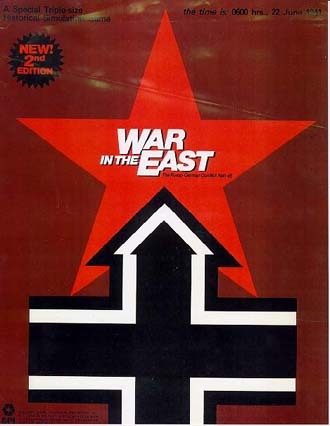 For them, the Europa game system East front games are recommended. WARGAME ACADEMY GAME TOOLS: War in the East 1st Edition, War in the East 2nd Edition, War In Europe (containing a War in the East 2nd edition and War in the West). I do not have a Decision Games version of War in the Europe 3rd edition but wrote 90% of the rulebook. Additionally, extensive wargame publication articles, errata, player articles, formatted PDF version of the CWIE rulebook and WGA edition of the rulebook (with additional optional rules pulled from other game titles, 1st edition WIE errata, designers notes, softcopy version of all rulebooks, etc) exist in the WGA archives.